Maxie Heating & Cooling is proud to serve the Mickleton community! About Mickleton, NJ - Happy to be your hometown Heating & Air Conditioning Contractor! Mickleton is a small area, full of history and charm in East Greenwich, New Jersey. Approximately 4600 residents call this area home. It has beauty in its natural amenities and historic attractions. 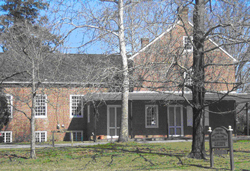 The 'Friends Meeting House,' a small Quaker church, is still used after 248 historical years. The Little Red School House was built by the Quakers in 1809 and for years it was the only school in the area. It is still maintained and used for special events. The Wagonhouse Winery produces fine wine. For years, the farm was a dairy and vegetable farm but has been in business as a winery since 2003. The comfortable Mickleton area is hot in the summer with the hottest days around 87 in July. The temperature drops to around 25 in January and the area sees approximately 20 inches of snow during the winter. It's a perfect getaway from the heat during certain months of the year and the quaint, close-knit family atmosphere makes it the perfect atmosphere for raising children.